The above video shows happy, healthy elephants in their natural habitat. The rest of this article explains what it's like for less fortunate elephants in Thailand and how your awareness can help get those elephants relocated to camps like the one in the video. When I first moved to northern Thailand with my two young sons (plus four dogs and a cat! ), we would spend some evenings visiting the night market in Chiang Mai. Like many westerners, we were excited whenever the man with the little elephant no taller than 5 feet walked towards us so we could stroke it. What we didn't know then, was that the elephant was only six months old and drugged with amphetamines to keep the poor animal working non-stop throughout the night. On the end of the mahout's stick was a hook embedded into the elephant's skin to stop it running away. Yaba, which is produced primarily in Myanmar, is a popular cheap street drug in Thailand. A combination of caffeine and methamphetamine, otherwise known as crystal meth, the "madness drug" or Nazi speed. Yaba pills are inserted into bananas and fed to these poor young elephants to stop them falling asleep. Using elephants for street begging has been illegal for years, but the police do nothing. Under fed, exhausted baby elephant forced to work through the night. Photo: Lek Chailert. Domesticated elephants have been used in Asia for logging, building and transportation for centuries. In 1989 logging was banned in Thailand and as a result many mahouts (elephant owners) saw no option other than to take their elephants to the city to earn money. 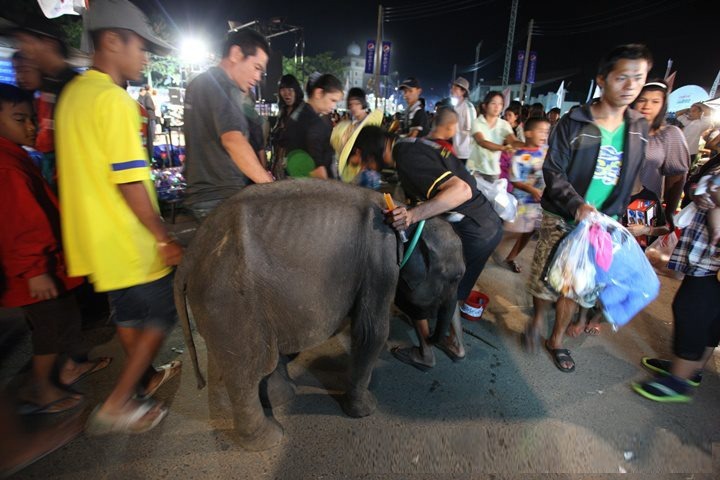 Even today, criminal groups buy these out of work elephants and rent them to people who take them into the cities to get money from tourists. Despite the logging ban, there is still today a thriving illegal timber trade. Illegal loggers use elephants to transport logs and feed the elephants amphetamine-laced bananas to keep them working non-stop so they can harvest as much wood as possible before the Monsoon rain season. The elephants become addicted to the drug and soon succumb to exhaustion or broken limbs caused by falls during frenzied efforts to shift the wood. They're then dumped by their owners. The problem became so severe that back in 1993 the government set up the Lampang Elephant Hospital in a forest just 100 km south east of Chiang Mai. Since its opening, the hospital has treated over 4,000 elephants. This is where drug addicted elephants are weaned off amphetamines. Others arrive at the hospital with injuries from knife or gunshot wounds, and more serious injuries from treading on landmines. This BBC video dates from 2017 and provides more information. What put me off when I first visited the hospital a few years ago, was that some of the healthier elephants were used to give rides to the tourist. A large, heavy wooden "trekking" seat was placed on their backs and two people at a time were mounted. Luckily that has stopped and today there are no shows or rides here. Visitors are free to wander around and visit the elephants in their rest and recuperation centers and sometimes even visit the treatment areas. Located just 60 km north of Chiang Mai is the Elephant Nature Park. 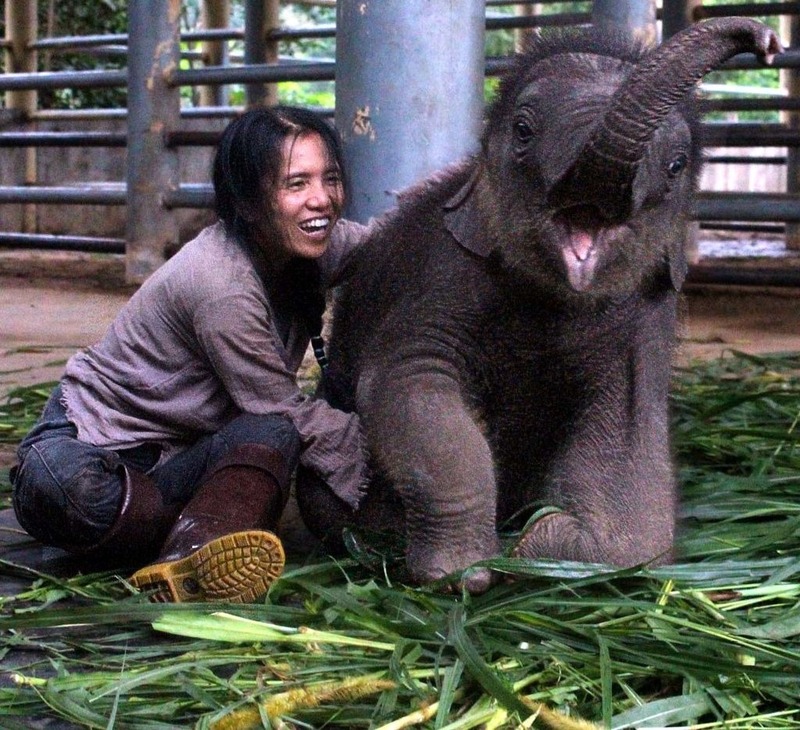 My favorite elephant conservation program and the first of it's kind in northern Thailand. While other camps make elephants sit on toilets, paint pictures and give rides to tourists, visitors here can only feed and bathe the elephants - no shows or rides - and that's how it's been since the camp opened in 1998. Elephant Nature Park is a sanctuary for elephants, cats, dogs, buffaloes and other rescued species. The park has won awards from the Smithsonian and been featured in National Geographic magazine. In 2005, TIME magazine named Lek Chailert the founder, Asian Hero of the Year. A visit to Elephant Nature Park​ is a full day event that starts with feeding the elephants bananas and melons. The name and history of each elephant is printed and pinned to the bamboo walls. One elephant I have never forgotten is Jokia. A logging elephant that was forced to log until the end of her 22 month gestation period. Exhausted, she gave birth among the logs. Some of the logs fell and crushed her newborn. When she panicked and ran around in despair, disrupting the other elephants, her mahout became angry and stabbed her in both eyes, blinding her. Jokia was eventually rescued and brought to the park where for almost two decades she has been the star of the herd. There are other blind elephants at the camp, but Jokia's story is particularly haunting. After feeding the elephants, you're taken to an area where a carer explains the history of Thai elephants, including the recent efforts and legislation to protect them. Then the best part. You follow the older elephants to the river where they lay down and wait for you to come and bathe them. They gently roll in the water as you wash them with river water. When they've had enough, they get up and walk back to their young in an area where visitors are not allowed, only because elephants are so protective of their young. But an elevated wood walkway above this area provides a bird's eye view of the herds as they regroup. The top video was taken from that walkway and shows the youngest in one herd wanting to join in the fun with other young elephants playing in the mud. Note how when he returns to his mother's breast, the older elephants come out of the water to surround and protect mother and child as the young calf feeds. 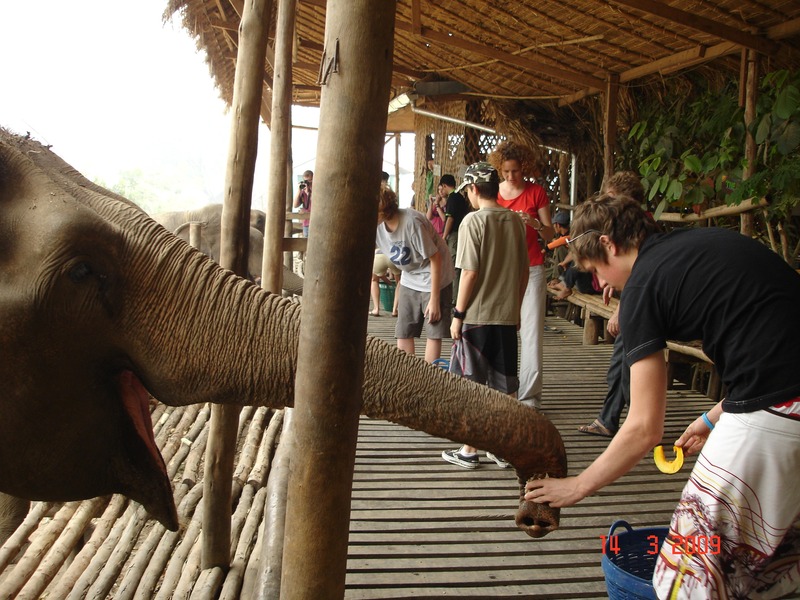 The park offers a 7 day Volunteer Experience that features elephant care, learning about agriculture and the local community, developing learning experiences with local school children and staying with locals in a tribal village in the mountains of Chiang Mai. Another program, called 7 day Volunteer Vet Program is only for Qualified Veterinarians and Veterinarian Nurses & Techs. Veterinary students are welcome and completed hours can be used as part of their coursework. Founder Lek Chailert with Navaan, born at the park October 2012. The success of Elephant Nature Park has provided an example to other camps across Thailand that there's more money to be made in educating the public (and locals) about elephant conservation, than there is exploiting the animals. Remember that next time you see an elephant, monkey or other animal on the end of a chain. Don't support what these people are doing.